we’ve got a BIG SHOW for you this week! High end maker Natuzzi leather sofa with recliners on either end, $895! 94″W Matching loveseat (not shown) with one recliner, $595. 70″W This set retails for over $6,000! Both pieces are in IMMACULATE condition! These won’t last! Round rattan and wood coffee table $395. Dining table and four chairs from POTTERY BARN, a steal at $995! 72×42 (As shown) Also includes two 18″ leaves! Bow back slipcovered chairs, $225 each! Four available. MAGNOLIA HOME FURNITURE by Joanna Gaines, $1,425. 108″W. We can special order this in other configurations, too. SPECIAL PURCHASE…we have a PAIR of these uber comfy stressless style chairs & ottomans in beige, $595 each. 29″W. We also have one available in soft blue-green! So pretty for spring…coordinating bird prints, $62 each. Home Again is your coastal connection! Now on sale for $175! GORGEOUS detail! Jenny Evans. All are hand poured with all natural soy wax, essential/natural oil blends, and cotton wicks! Scents include: Love spell, sea mist, lemony verbena, french lavender, and fig & flowers. Just $12 each! Our price, $1,295. 64″W Absolutely like new. We ADORE these beige geometric print chairs, $265 each. our price, $1,196! EXCELLENT CONDITION! 54″ round plus an additional 18″ leaf included! Trio of wood and metal 29.5″ barstools, JUST $50 each! we have it on sale for $495!! We have a PAIR of these soft grey accent chairs for $295 each. brand new for $425 each! Super-duper cute shabby chic dresser with mirror, $275! 43.5x20x66 Phone orders accepted, 910 679 4302. Sorry, coffee table has sold! ON SALE NOW for only $550! Don’t we all wish to be mermaids? $62 each, 16×20. Also available in 5×7 for $18 each! 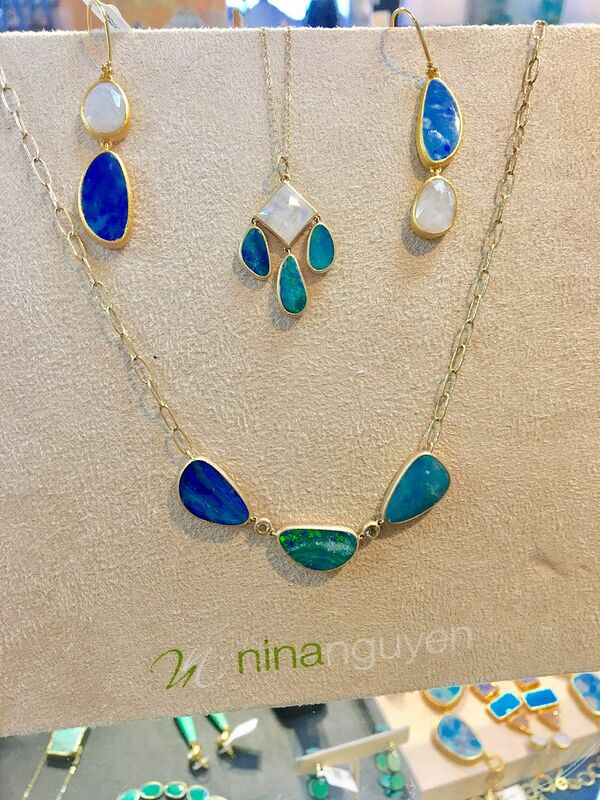 We sure did feel the LOVE during our Nina Nguyen trunk show. JUST IN…designer pieces for less! 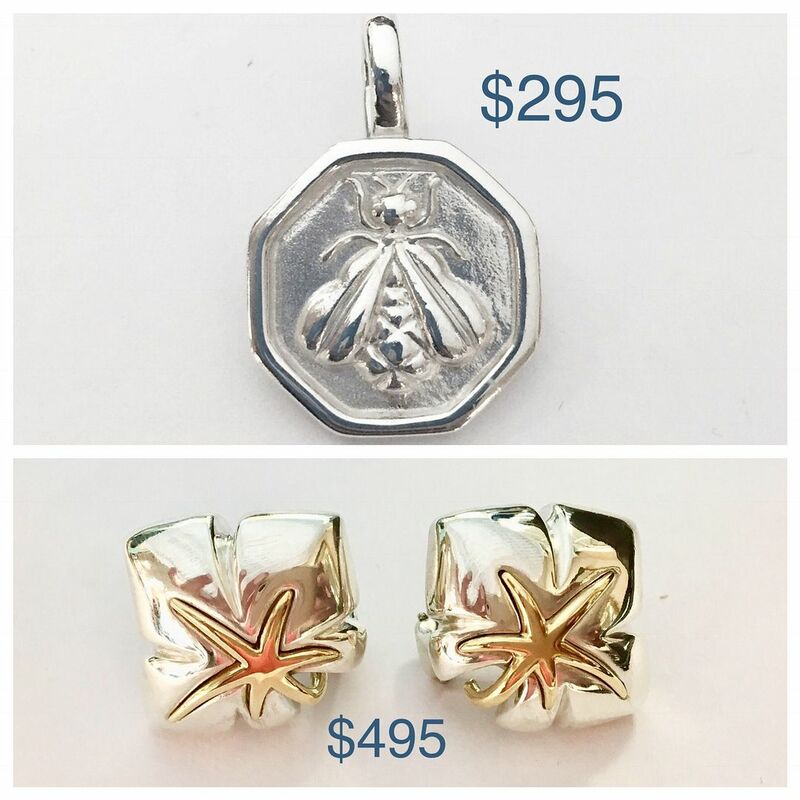 Slane bee pendant and Tiffany & Co. starfish omega back earrings. Click on this picture to see more. Charles Garnier earrings just in for half the retail price! 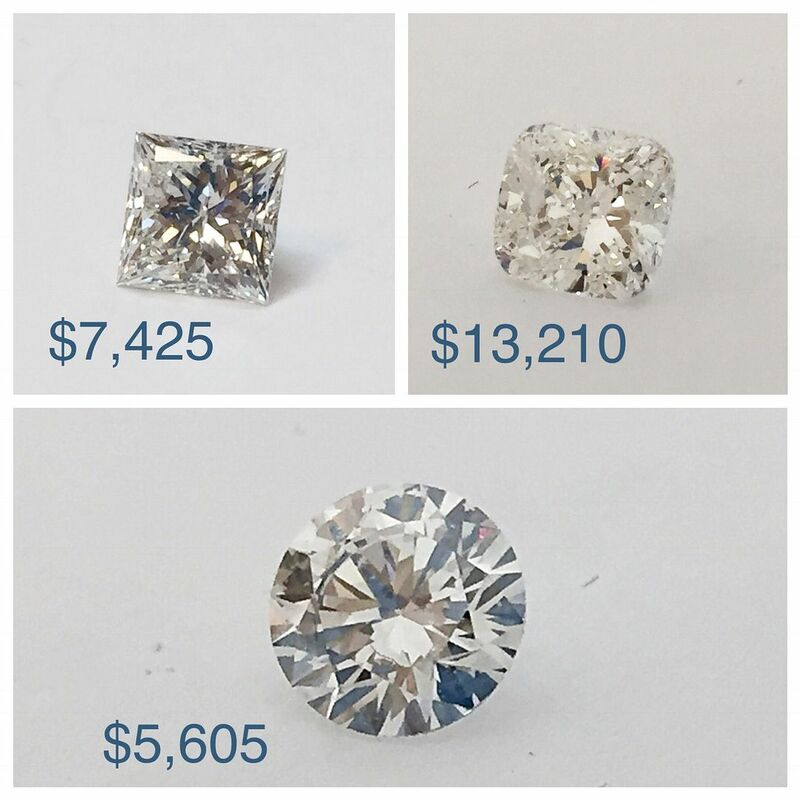 We also have GIA certified diamonds in stock. Check out these amazing prices. A GIA certified natural ruby ring for less…natural sapphires too. 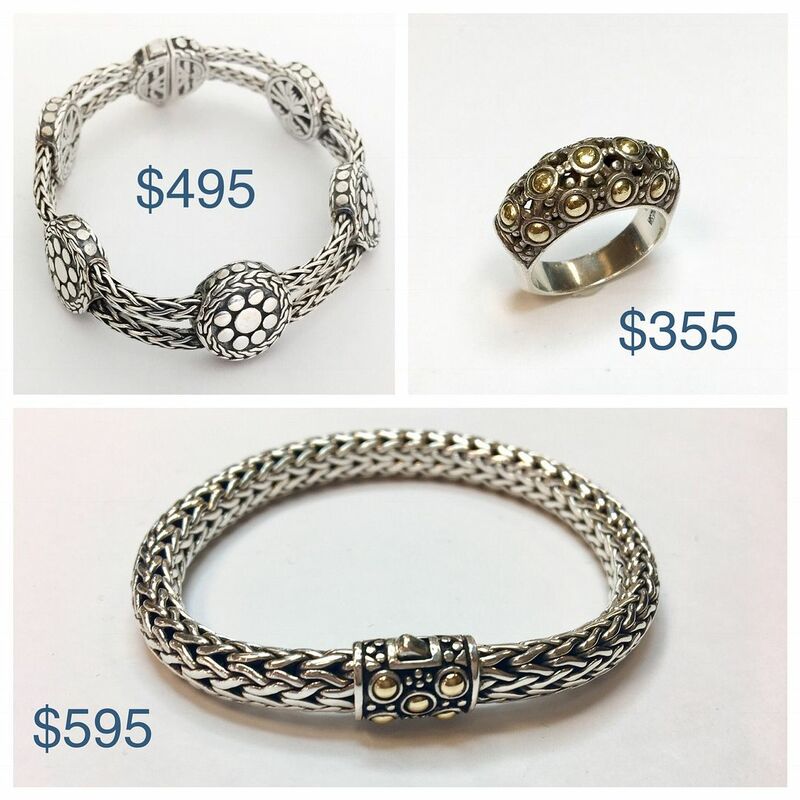 Check out the prices on these 14k gold bracelets. 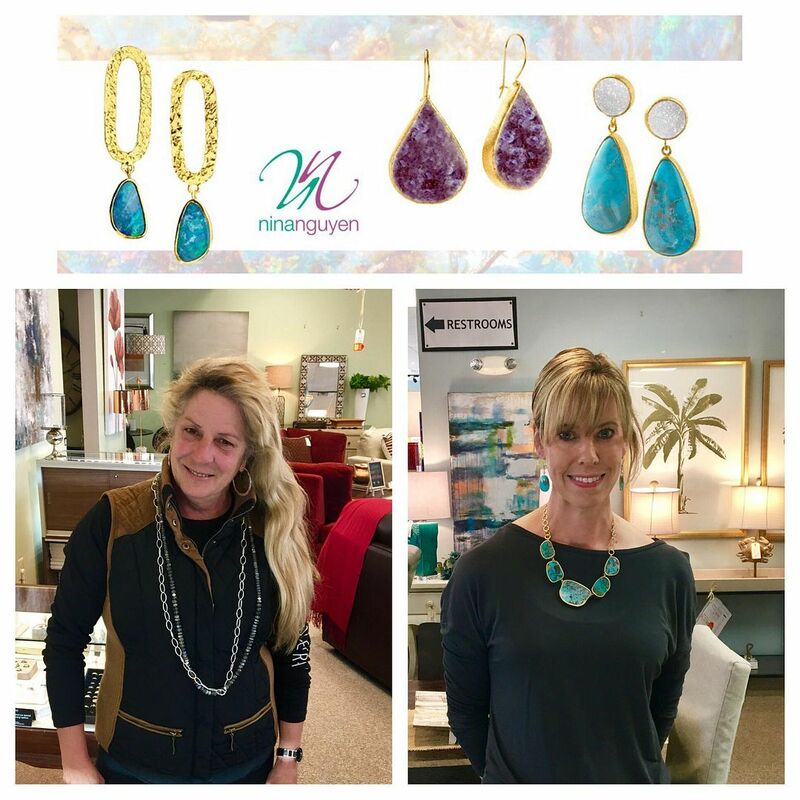 Didn’t make it to the Nina Nguyen trunk show? 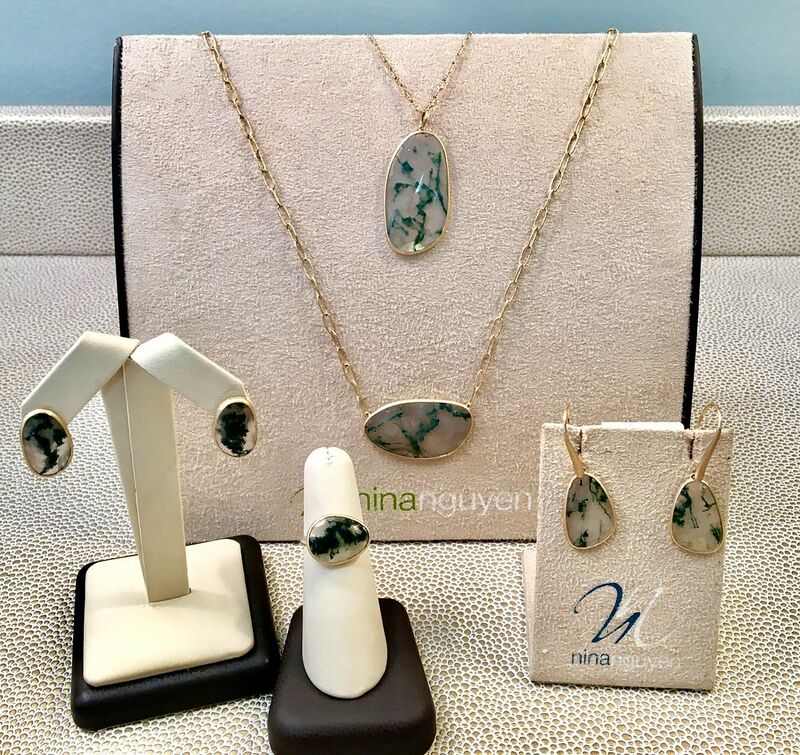 Don’t fret, due to numerous customer requests, Nina is letting us keep the pieces from the trunk show until the end of the month. from stalactites. Earrings 14ky gold $395. Pendant 14ky gold $155. 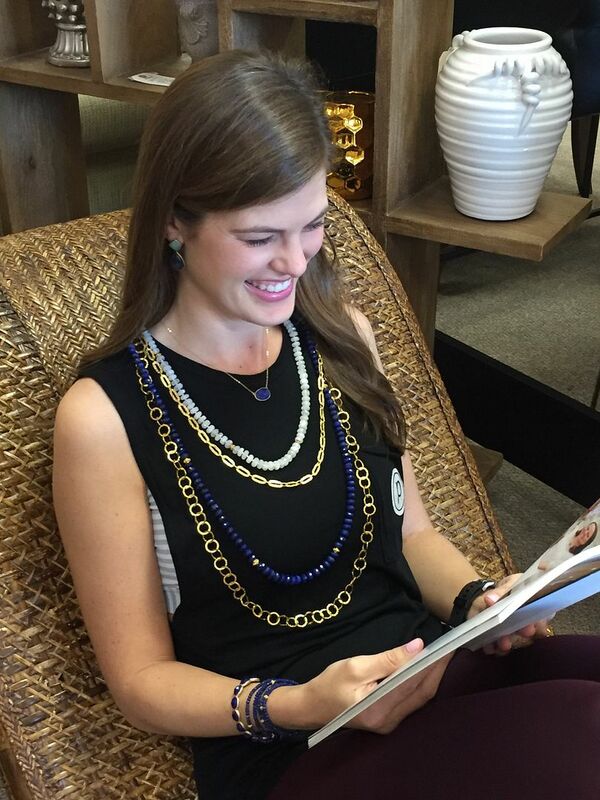 Necklace is 34 inches, 14ky gold $645. Perk up your wardrobe with layers. Moss agate get its name from the dendritic inclusions of manganese or iron that has grown into patterns similar to moss. These are all set into 14ky gold. Stud earrings $315. Dangle earrings $675. Pendant $555. 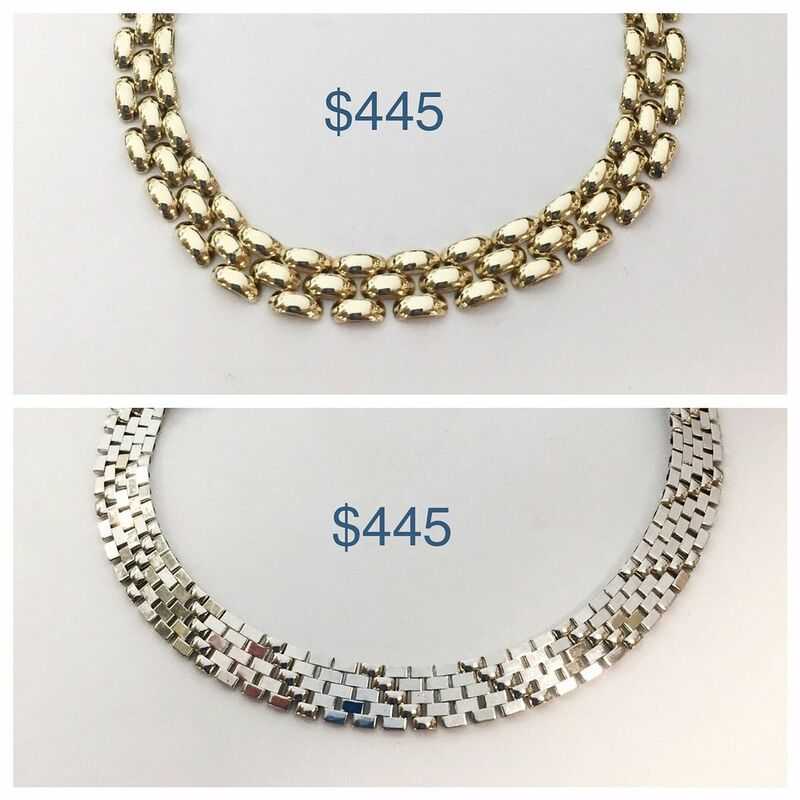 14ky gold 32 inch chain $635. 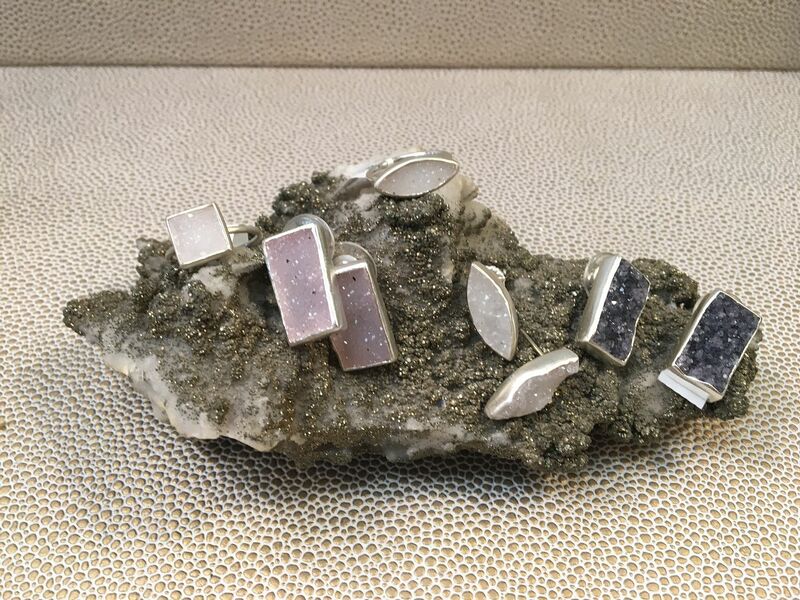 Did you know that tourmaline can grow inside of quartz? Naturally these two gemstones grow together. All of these are set into 14ky gold. Studs $325. Dangle earrings $675. Ring $325. 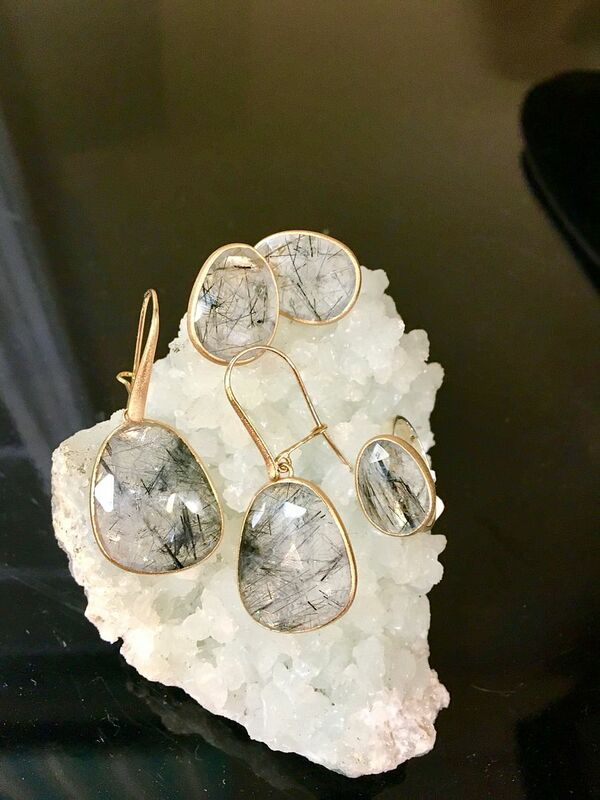 Druzy jewelry from Nina sparkles like diamonds. 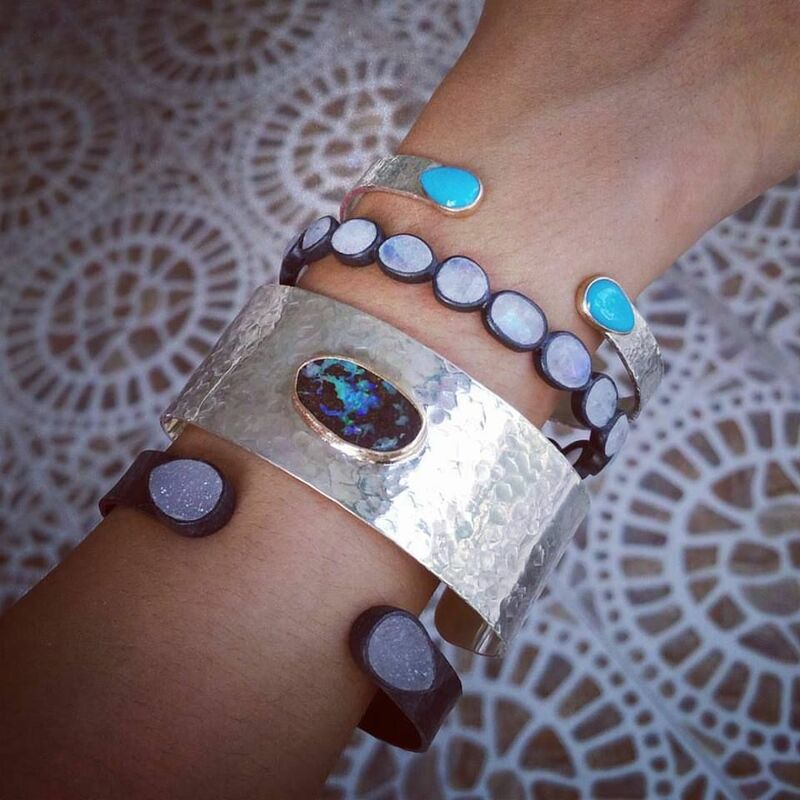 Prices ranging from $155 to $235. 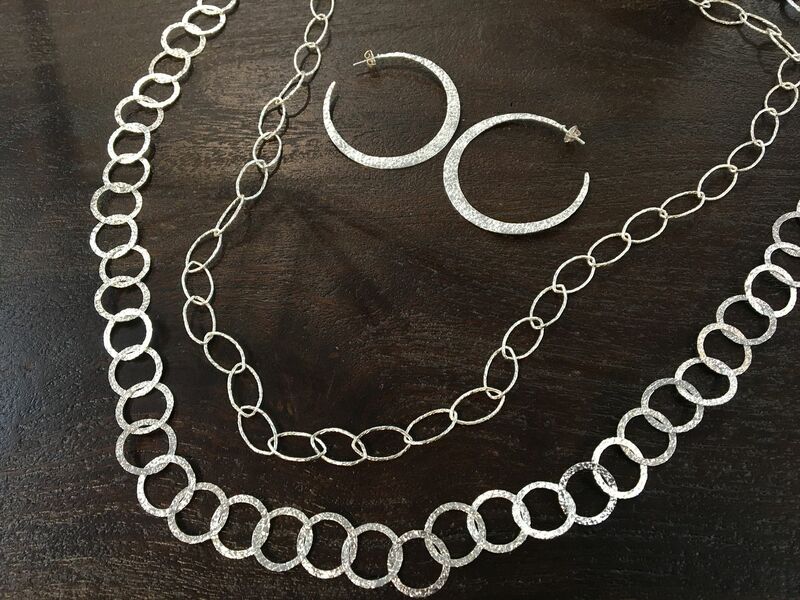 You can’t go wrong with sterling silver hoops and long necklaces. Hoops $196. Marquise link necklace 32 inches $316. 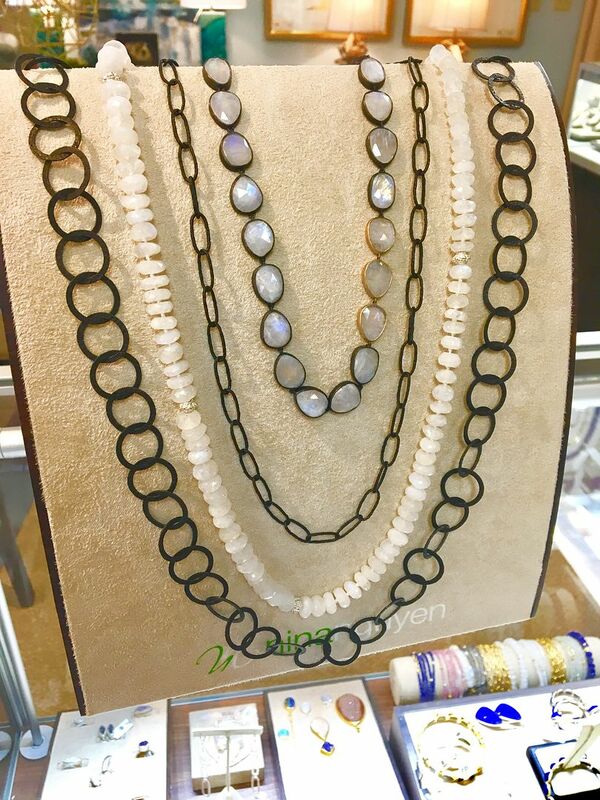 Hammered circle 32 inch necklace $476. 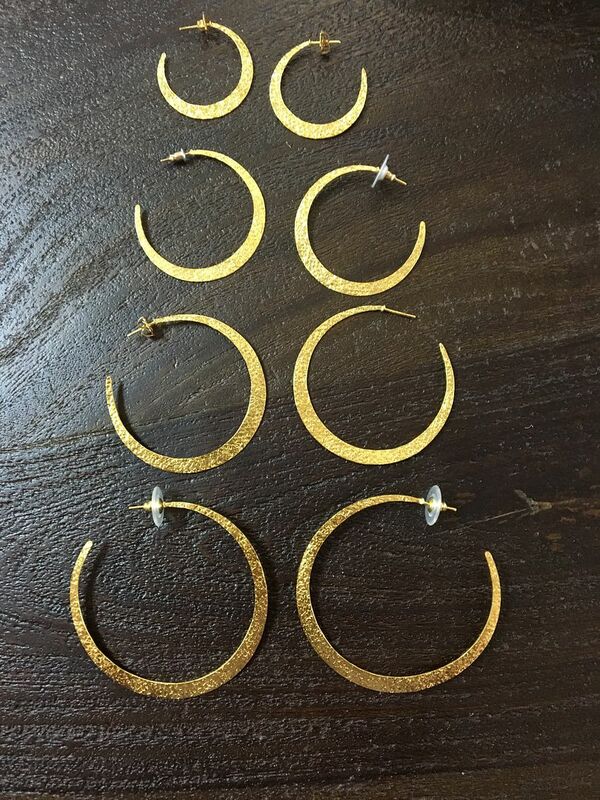 These crescent Nina hoops glow brighter than the moon. Small to her staple OMG size. Prices range from $135 to $235. Take your pick or buy all four. $395 each. 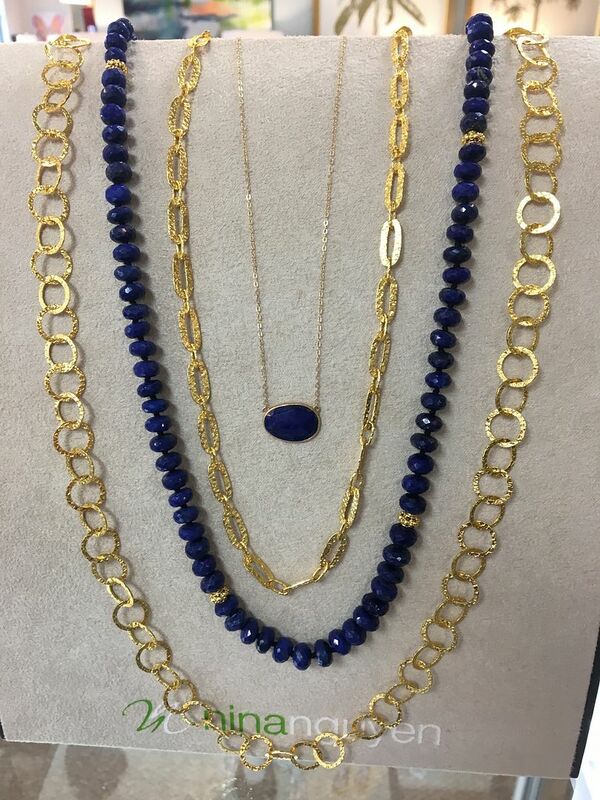 Lapis looks so good in yellow gold. Hoop earrings $1.200. Dangle earrings $680. Studs $305. 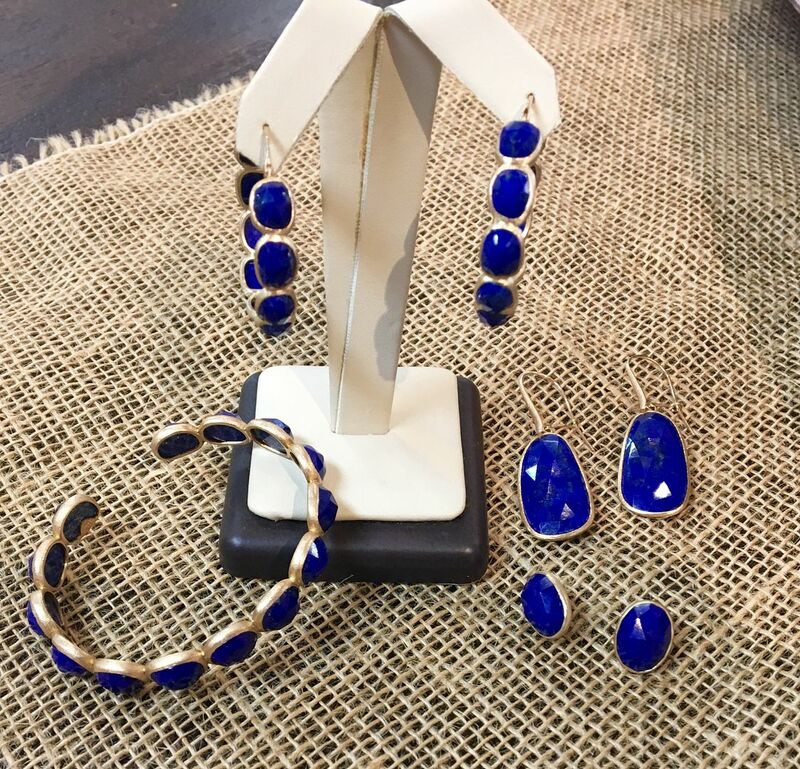 Nothing is more precious than sapphire jewelry. Studs in 14k gold $380. 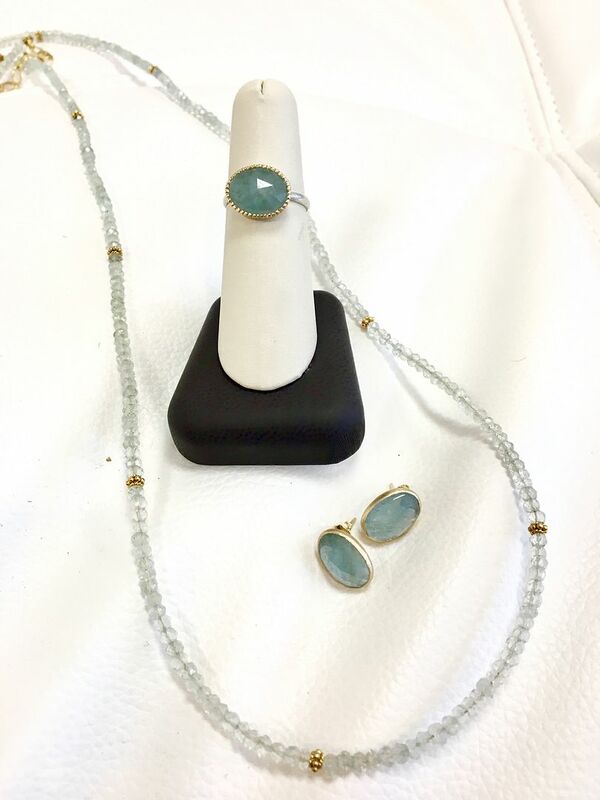 Dangles with green chalcedony in 14k gold $720. 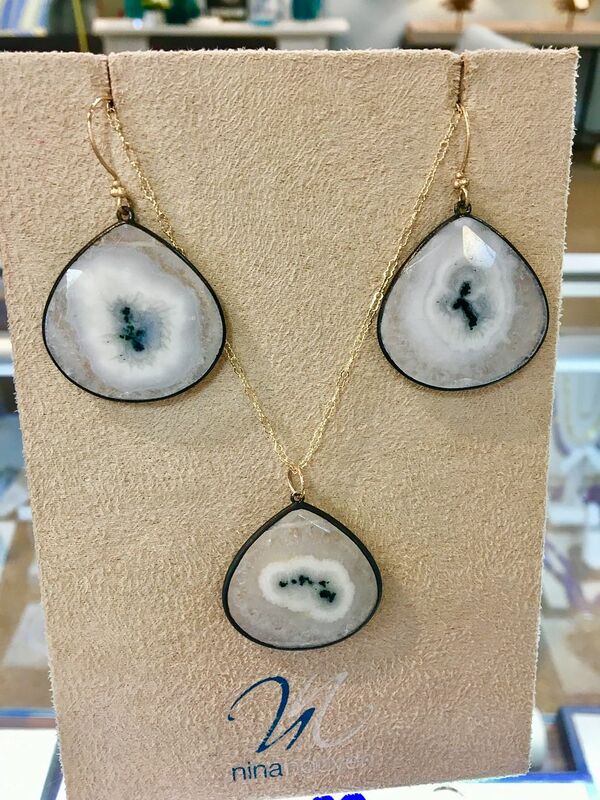 Sapphire faceted beads with marquise shaped geode necklace $395. This match is perfect for the beach girl. 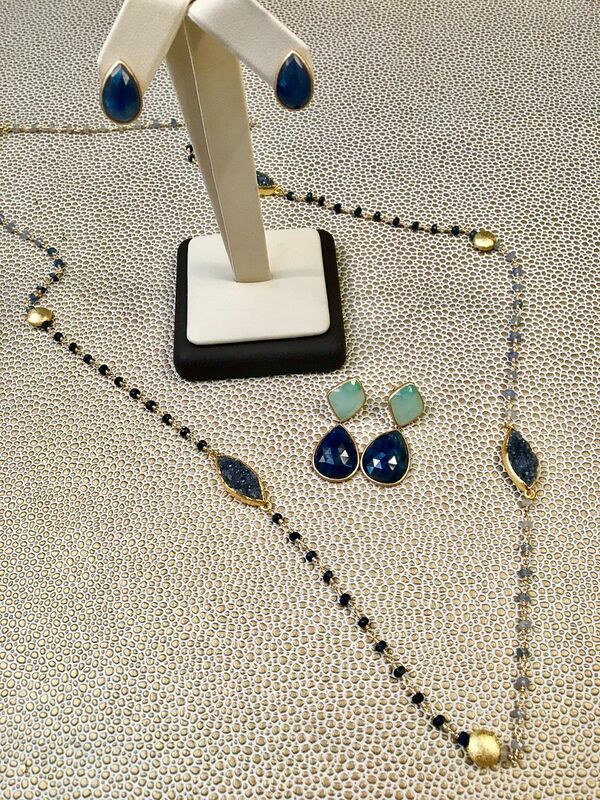 Earrings in pearl and turquoise $396. and diamonds in 14ky gold. 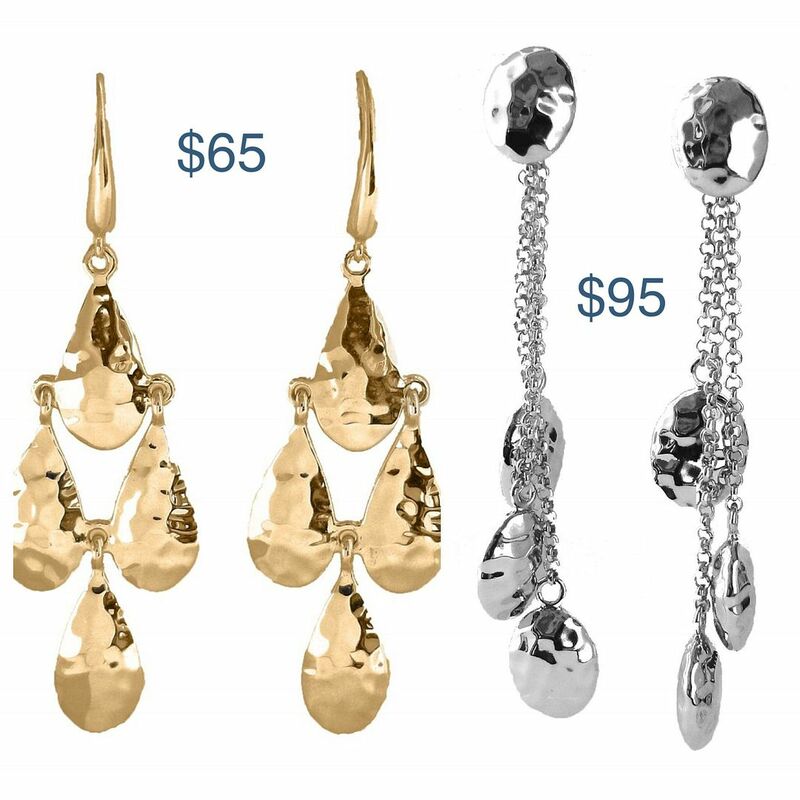 Dangle earrings $396. Rainbow and opal necklace $1,445. 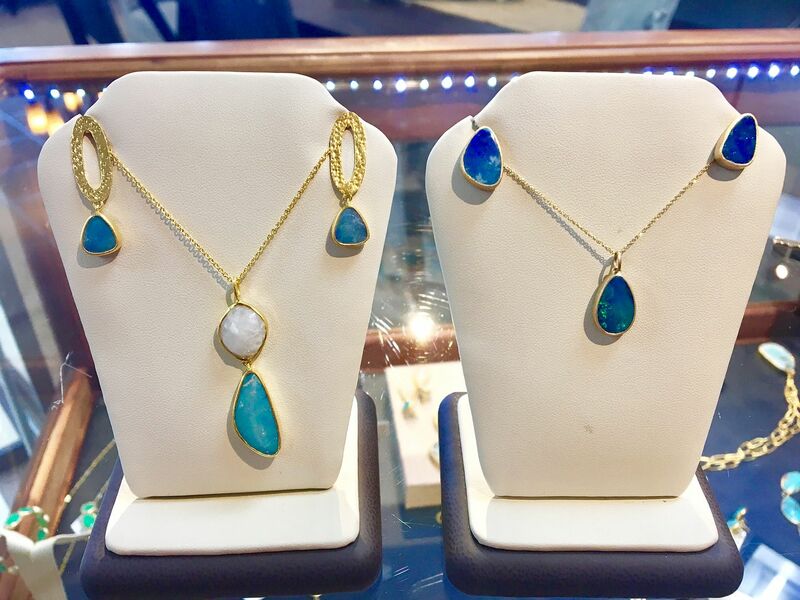 Three opals with rose cut diamond necklace $1,925. Prices ranges from $235 to $480. Just in time for the March birthdays. 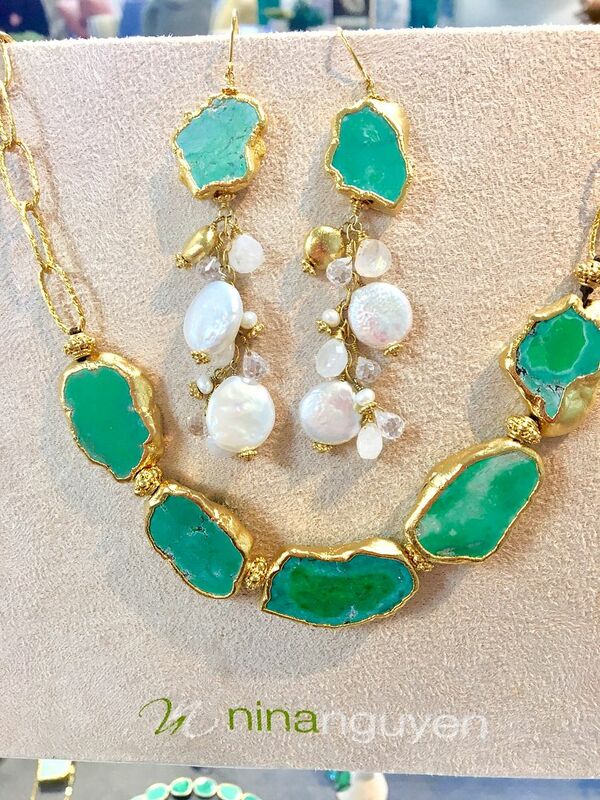 Necklace $235. Studs $315. 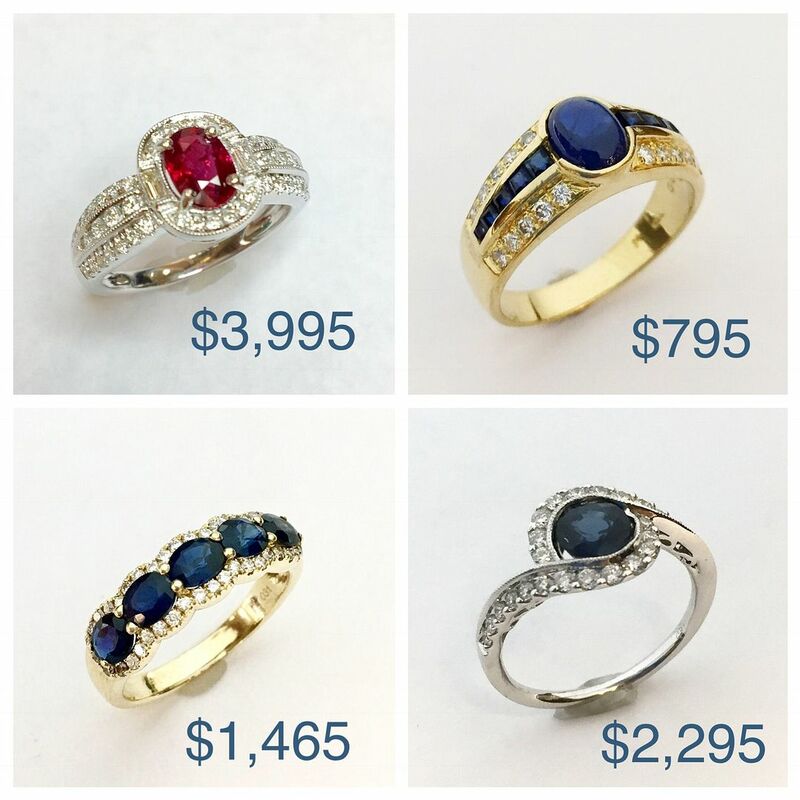 Ring $392.